HAVING NOT FOUGHT since his defeat to Conor McGregor last year, Nate Diaz’s absence from the octagon looks set to end. According to an Instagram post (which has since been deleted) from Jose Garcia, his strength and conditioning coach, Diaz is back in training camp for the first time since he lost a rematch to McGregor via majority decision in August 2016. As for a potential opponent, speculation is mounting that Diaz will be handed an opportunity to dethrone Tyron Woodley, the UFC’s reigning welterweight champion. Ariel Helwani of MMAFighting.com has reported that while no deal is yet in place, a fight between Woodley and Diaz is being considered as a potential main event for UFC 219, which will take place in Las Vegas on 30 December. With just over six weeks to go, the UFC are under pressure to find a suitable headline bout for their end-of-year event at the T-Mobile Arena. Woodley has held the 170-pound title since his first-round knockout of Robbie Lawler in July 2016, before having to settle for a majority draw against Stephen ‘Wonderboy’ Thompson in his inaugural outing as champion last November. After overcoming Wonderboy by majority decision in a rematch in March, Woodley got the better of Demian Maia over five rounds in July to retain the strap. While the winner of the 16 December bout between Robbie Lawler and Rafael Dos Anjos could eventually be rewarded with a title shot, the welterweight division currently isn’t awash with worthy contenders. 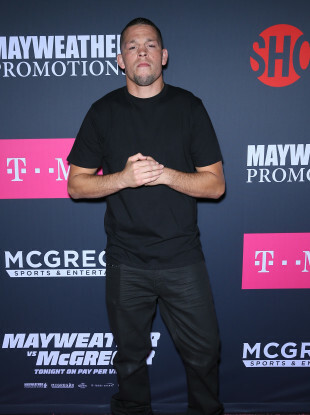 Nate Diaz could be in line to fill the void in the meantime. “Don’t be surprised if you see me in the next couple of days announce a fight,” Woodley said yesterday in an interview with FloCombat, in which he hinted at a slightly unexpected opponent for his next outing. Diaz’s last UFC victory came in March of last year when he submitted current UFC lightweight champion Conor McGregor, before losing to the Dubliner in the aforementioned rematch five months later. The 32-year-old California native came up short in his only previous bid for UFC gold. Diaz suffered a unanimous-decision loss to Benson Henderson in a lightweight title bout in December 2012. Email “Diaz could get title shot as Woodley expresses interest in UFC 219 bout”. Feedback on “Diaz could get title shot as Woodley expresses interest in UFC 219 bout”.